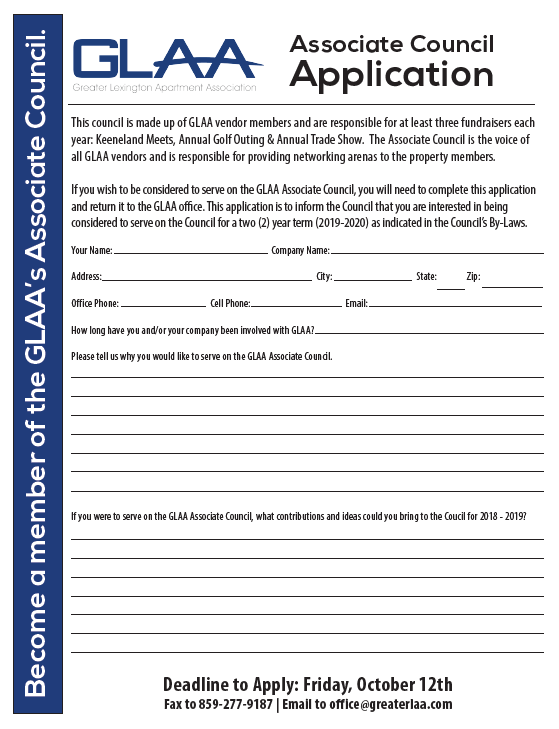 Do you want to be a part of the GLAA's Associate Council? This council is made up of GLAA vendor members that are selected and/or volunteers, for open seats on the council. They are responsible for at least three fundraisers each year: Keeneland Meets, Annual Golf Outing & Annual Trade Show. The Associate Council is the voice of all GLAA vendors and is responsible for providing networking arenas to the property members. To apply, download the form HERE. APPLICATION DEADLINE IS FRIDAY, OCTOBER 12TH.